What is PACE? | How will PACE advance beyond previous ocean color missions? | Why is understanding and protecting ocean ecosystems important? | Why is understanding and protecting the atmosphere important? | Why measure the atmosphere and ocean together? | What are some of the products that PACE will deliver? | Who will benefit from PACE data and its applications? | How will PACE monitor ocean ecology? 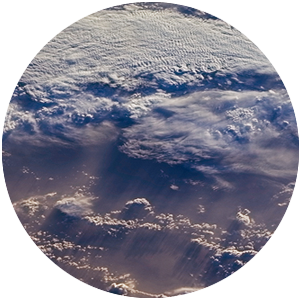 | How will PACE provide insight into aerosols and clouds? | How will PACE help us to better track the carbon cycle? | How will PACE benefit the economy and society? PACE is NASA's Plankton, Aerosol, Cloud, ocean Ecosystem mission, currently in the design phase of mission development. It is scheduled to launch in 2022, extending and improving NASA's over 20-year record of satellite observations of global ocean biology, aerosols (tiny particles suspended in the atmosphere), and clouds. PACE will advance the assessment of ocean health by measuring the distribution of phytoplankton, tiny plants and algae that sustain the marine food web. It will also continue systematic records of key atmospheric variables associated with air quality and Earth's climate. To extend key systematic ocean color, aerosol, and cloud data records for Earth system and climate studies. To address new and emerging science questions using its advanced instruments, surpassing the capabilities of previous and current missions. Ocean Color Instrument (OCI) - Spectrometer used to measure intensity of light over portions of the electromagnetic spectrum: ultraviolet (UV), visible, near infrared, and several shortwave infrared bands. The OCI will enable continuous measurement of light at finer wavelength resolution than previous NASA ocean color sensors, providing detailed information on our global ocean. The color of the ocean is determined by the interaction of sunlight with substances or particles present in seawater such as chlorophyll, a green photosynthetic pigment found in phytoplankton and land plants. Multi-angle Polarimeters - Radiometers used to measure how the oscillation of sunlight within a geometric plane - known as its polarization - is changed by passing through clouds, aerosols, and the ocean. Measuring polarization states of UV-to-shortwave light at various angles provides detailed information on the atmosphere and ocean, such as particle size and composition. Combined, these instruments will be a major advance in satellite observing technology, allowing for new opportunities to monitor and respond to changes in our ecosystem, and the ways in which the atmosphere and ocean interact. How will PACE advance beyond previous ocean color missions? PACE's OCI instrument will be the most advanced for observing ocean color in NASA's history. Observing chlorophyll from space has a long heritage – the first ocean color satellite, NASA's Coastal Zone Color Scanner (CZCS) was launched in 1978. CZCS was a multi-spectral radiometer, meaning that it only collected data at a few specific wavelengths in the spectrum. As technology progressed, newer instruments have launched that sample additional wavelength bands, but they still don’t reveal the entire story. 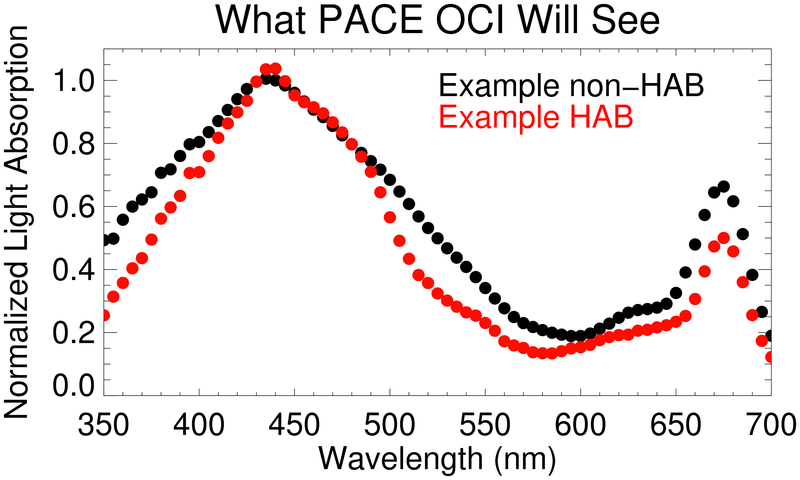 PACE represents a leap forward because it will view a very broad spectrum from 350 to 885 nanometer (nm) wavelengths at 5 nm intervals – making it hyperspectral. The range that PACE's instruments will observe includes the UV (350-400 nm), visible (400-700 nm), and near infrared (700-885 nm), as well as several shortwave infrared bands. Thus, the OCI will provide an unprecedented view of the ocean without the "blind spots" of previous sensors. It is revealing to compare the OCI to a current ocean color sensor, such as the Visible Infrared Imaging Radiometer Suite (VIIRS) aboard Suomi National Polar-orbiting Partnership. Launched in 2011, VIIRS has been collecting data at five visible bands. 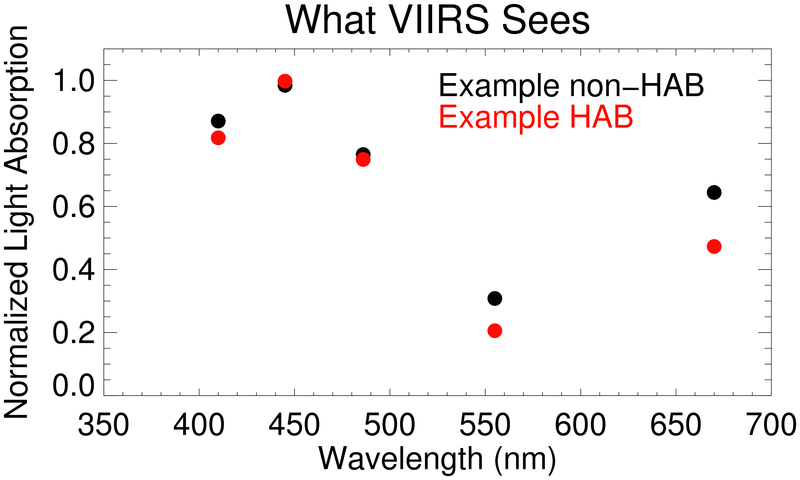 The plot of VIIRS data shows individual data points representing example Harmful Algal Bloom (HAB) conditions in red and non-HAB conditions in black. In contrast, data on the PACE OCI plot is a much more complete picture, illustrating the nuances between the spectra of the two groups, aiding in their identification. Different types of phytoplankton have unique spectral patterns. By comparing their spectral signatures, scientists can identify the difference between harmful algal blooms (HAB) and those that are beneficial. Thus, PACE's Ocean Color Instrument (OCI) will provide an unmatched level of detail about the health of our marine ecosystems. 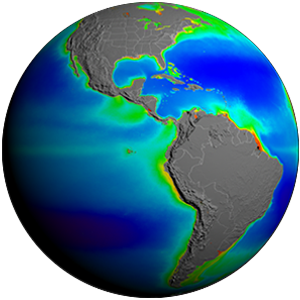 PACE's unprecedented spectral coverage will provide the first-ever global measurements designed to identify phytoplankton community composition. This will significantly improve our ability to understand Earth's changing marine ecosystems, manage natural resources such as fisheries, and identify harmful algal blooms. Why is understanding and protecting ocean ecosystems important? The ocean is a critical part of the world's economy. Forty percent of the world's population lives within 100 km (62 mi) of a coastline, with fisheries and aquaculture supporting ~12% of the world's livelihoods. 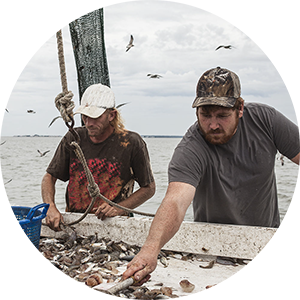 In the U.S. there are nearly 3 million jobs related to the ocean economy, contributing over $282 Billion to the U.S. Gross Domestic Product (GDP). Why is understanding and protecting the atmosphere important? PACE's observations of aerosols and clouds will be used by industry, universities, federal agencies, and scientists to improve our understanding and ability to forecast weather and climate. For example, PACE will provide key information on aerosols such as airborne dust, pollen, smoke and haze. These particles can significantly reduce air quality, leading to asthma and respiratory distress among vulnerable people. Studying aerosols and clouds together will also be an important contribution by PACE. Aerosols impact the amount of solar energy reaching Earth by absorbing and scattering incoming radiation and through their interactions with clouds. PACE will measure the size of cloud drops and ice crystals, improving the ability to differentiate between ice and water clouds. Currently, the effect of human-produced aerosols on clouds – and the impact on climate – is not well understood. Measurements from PACE will help to clarify the connections between aerosols, clouds, and climate. Why measure the atmosphere and ocean together? The ocean and atmosphere are directly connected, moving and transferring energy, water, nutrients, gases, aerosols, and pollutants. Aerosols, clouds and phytoplankton can also affect one another. For example, certain aerosols may contribute to plankton blooms, while some plankton produce substances that act as seeds for cloud formation. How aerosols influence the ocean ecosystem – and vice versa – are key questions PACE scientists plan to investigate by looking at a broader picture of ocean and atmosphere interactions. These complex relationships are part of the larger climate system, and thus it is advantageous to study them together. Looking at these related processes will also allow for investigation into a variety of new research areas. For example, PACE measurements may provide a better look at dissolved organic material in the water, the composition of communities of phytoplankton, and the effects of El Niño events on fisheries. What are some of the products that PACE will deliver? PACE's OCI and polarimeters will deliver a variety of science data products. Who will benefit from PACE data and its applications? Natural resource managers focused on water quality for human health, commercial fishing and disaster management. Researchers in the fields of ocean biology, ecology, biogeochemistry, atmospheric aerosols, and clouds. Military users of data for environment characterization and weather and visibility forecasts for regions of operations. Government agencies for managing fisheries and determining human health predictors. Renewable energy and commercial sectors with interest in environmental technology, development, resources, management tools, and environmental forecasting. Educators of the general public. Policy makers and economists at local, state, regional, tribal, federal and international levels. The ocean's health is important for maintaining the health of the Earth – and the ocean's health starts at its smallest inhabitants, phytoplankton. By taking in carbon dioxide, these microscopic plants and algae play an active role in moving carbon from the atmosphere into the ocean. Many commercially important fisheries also depend on the timing and composition of blooms of phytoplankton. Thus, monitoring phytoplankton distribution and abundance can help us to better understand the complex systems that drive ocean ecology. ... provide insight into aerosols and clouds? The effects of aerosols and their interactions with clouds are some of the most poorly understood components of Earth's climate system. Clouds and aerosols can absorb, scatter or reflect incoming radiation depending on their type, abundance and locations in the atmosphere. PACE instruments will monitor both, providing new data on their abundance, properties, and interactions over time, and will contribute to air quality forecasts. ... help us to better track the carbon cycle? 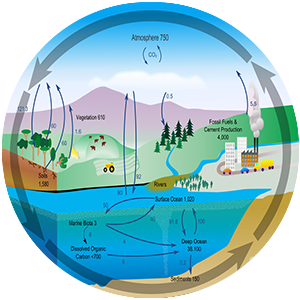 The carbon cycle involves every ecosystem on Earth, including life in the ocean. Phytoplankton play a key role in converting atmospheric carbon into other forms, which can be consumed by other organisms, exported to the deep ocean, or returned to the atmosphere. The diversity of phytoplankton – and the myriad pathways by which they can transport carbon – makes understanding this group of organisms crucial for understanding climate processes. ... benefit the economy and society? PACE will provide a combination of atmospheric and oceanic observations to benefit society in the areas of water resources, disaster impacts, ecological forecasting, human health, and air quality. Users at local, state, federal and international agencies as well as the general public will be able to apply data from PACE to make more informed and robust decisions about their activities. For example, PACE will offer an opportunity to better monitor fisheries, identify harmful algal blooms, and observe changes in marine resources.